EU referendum... lessons from 1975 Jump to media player For BBC Newsnight, Michael Cockerell looks back at the UK's 1975 referendum on Europe - and draws out similarities and differences between then and now. EU referendum - The five key issues Jump to media player The five key issues which are likely to be debated in the lead up to the referendum on European Union membership are explained by Norman Smith. Could there be a second EU referendum? Jump to media player Dr Alan Renwick from the Constitution Unit at University College, London explains the process that takes place once a country decides to leave the EU. What can we learn from the 1975 referendum on Europe? The last referendum in the UK on the issue of Europe was on 5 June 1975. Two-thirds voted in favour of staying in the European Economic Community (EEC), as it was then known. 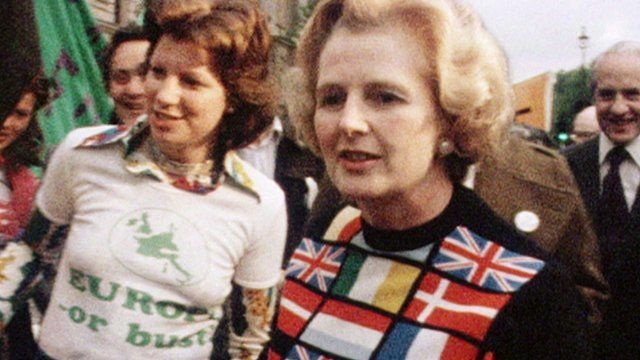 For BBC Newsnight, veteran journalist and documentary maker Michael Cockerell - who reported on the 1975 referendum - looks at what we can learn from the vote 40 years ago.